Free Auto Clicker is handy to automatically clicking your mouse buttons, making mouse clicks faster and more accurate. Thus, it frees you from repeated work that requires a lot of clicking. In order to auto click your mouse, you need to get the mouse click point at which you want to perform clicking. 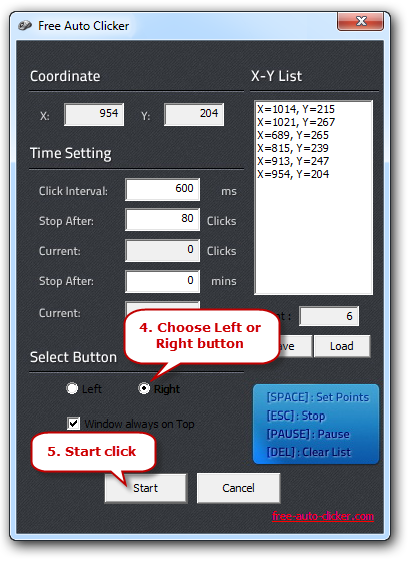 Here’s the way to get the point in X & Y coordinates on your screen. 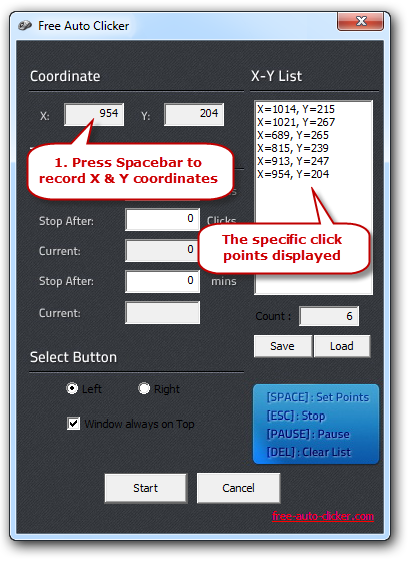 Move the mouse cursor to the place where you would like the program to click, and press the Spacebar so that the X & Y coordinates will be displayed in X & Y boxes, and the click at this point can be saved. 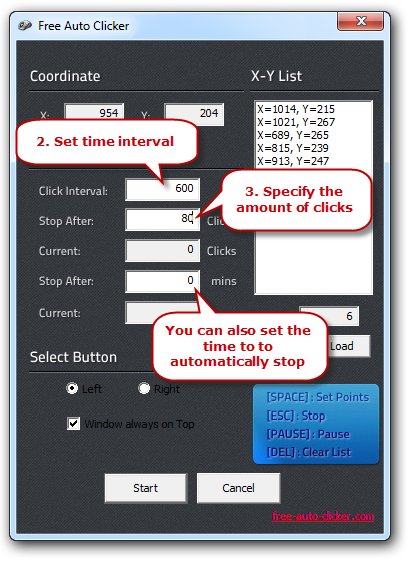 It will record one or multiple specific click points in sequence in X-Y List. The list can be saved as FAC file so that you can load it the next time you need the same actions performed. In the “Time Setting” section, you can set the interval at which the clicks will occur by entering the value in “Click Interval”. You can set the clicker to automatically stop after a desired amount of clicks or time, each of which has a counter to count the clicks or time in milliseconds. You can check to automate left click or right click on your computer. Uncheck “Window always on Top” if you don’t want to place the clicker on top of other active windows. When everything is ready, click “Start” to start clicking. You can press Pause/ESC on keyboard to pause/stop clicking.